Posted on January 27, 2019 January 26, 2019 by SherylPosted in FoodTagged corn, recipes. I love corn puddings and scalloped corn, and this sounds healthier than the one with cornbread and sour cream that’s been so popular the past few years. I mostly don’t use canned vegetables, except for tomatoes, but there are some good brands of canned corn that are good. I don’t think that I’ve ever had the cornbread and sour cream version of scalloped corn. When I make scalloped corn, I use the recipe in a Betty Crocker Cookbook that I received as a wedding shower gift years ago. My friend makes the recipe with the cornbread added. She calls it “corn surprise” because she is a self-proclaimed lousy cook yet everyone LOVES this recipe! My friend who started making it for every holiday dinner said the same thing. Even better, it can be made the day before. Just take it out of the fridge, bring it to room temperature, and put it in the oven to warm. No muss, no fuss. This recipe sounds wonderful. I’m going to have to look for it. A special place at people’s tables! Wow, it’s really easy. Thanks! Just this week, one of my Korean colleagues made corn custard and brought me some. “Silky” is a great description. 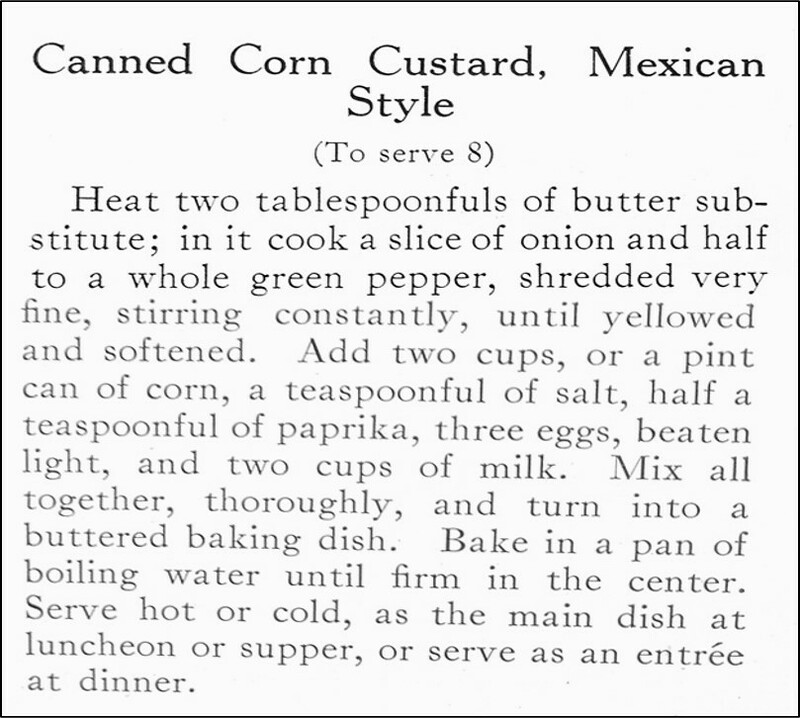 It was new to her (corn custard–she did not use the “International version”). I had not thought about corn custard, nor eaten it, in years, and it was delicious. The recipes that I find from a hundred years ago generally contain relatively small amounts of spices or peppers, so I think that you’re right that “Mexican Style” may have referred to the green peppers. Corn custard is a generational family favorite. As we now live close to the border, spicing it up sounds delicious. Similarly to you, scalloped corn was a favorite at church dinners and family reunions when I was growing up in Pennsylvania. (I think that difference between corn custard and scalloped corn is that the dish of corn custard is put in a pan of hot water while baking, and for scalloped corn the baking dish is not put in hot water). It almost seems like a comfort food. Yup, that’s about right. We called it baked corn and it was just put in a Corningware baking dish and popped it in the oven. This sounds like a recipe my grandmother would make. Can’t go wrong with a good corn dish. This dish reminds me of my grandmother, too. Yes, there is some canned corn that really is good…Niblets comes to mind. 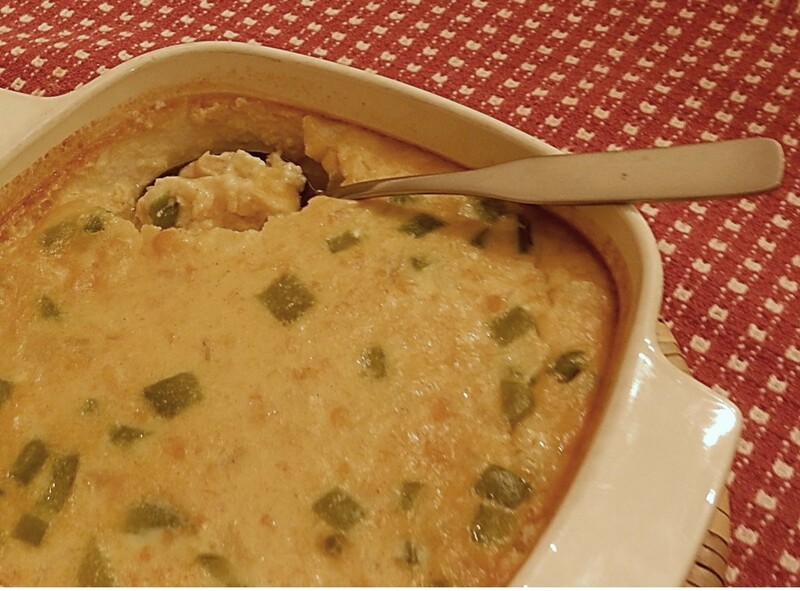 My husband would love this version of corn custard. I agree – Except for canned tomatoes, canned corn is the only canned vegetable that I buy. If it was Mexican style the peppers would be jalapeños.😊 this is go though Mexican style or not. I think that you’re right – that if this recipe was published today that it would call for jalapenos. The way the recipe calls for putting the baking dish in a pan of hot water while it cooks results in a creamier and more custard-like dish than the typical recipe. The hot water bath slows how quickly the Corn Custard becomes firm, resulting in a creamier dish. This would make a nice dish for Easter. Great to have a new dish for the holiday! Years ago, a friend gave me a similar recipe. It’s perfect with roasts and on cold days. Like you, I use creamed corn. Yes, Corn Custard would pair nicely with a roast. Sounds really good and I would probably pair it with roast and a salad. Printed it out and will definitely try! Sounds good! The husband might like this! It’s tasty in an old-fashioned way. I love corn but we don’t really do anything with it in the Uk so it sounds like a dish to try. It’s yummy, and it’s a fun dish to make. It’s nice to hear that you enjoy seeing the recipes I select. I generally make recipes that seem interesting to me for one reason or another. It might look like a recipe that I think that my family might enjoy . . . or I might not be able to quite picture what the dish would look like and decide to give it a try. . . It is a perfect comfort food. Love reading your blog, Sheryl! This recipe certainly reminds me of days gone by. It’s nice to hear that you enjoy it. I really enjoy making the hundred-year-old recipes. I’m often surprised by how many of them remind me of the mid-century recipes that our families regularly made. Sounds delicious! We’re having cold gray weather and this sounds like a perfect treat. It reminds me of a Mexican cornbread I make using creamed corn and peppers, and it’s so good – now I have to try this one!